It's official and I can finally tell...we are moving. When we moved from east Tennessee back to middle Tennessee I thought we were here for good. Settled I guess you could say. But, life is funny. It likes to remind you that you don't really know what you are doing after all. Michael and I both graduated from the University of Tennessee. I spent a total of 7 years in Knoxville and Michael spent 5. We desperately tried to get back near our family so we could start one of our very own and we've been blessed to live near both my parents and Michael's for two whole years, but now it is time to pack up and leave again. Where are we headed you might ask? Oh, well that would be back to east Tennessee of course. Life's got jokes. Seriously. It's a little further east than we were before and I'd give you the exact location, but I'm not quite sure what that is just yet myself. 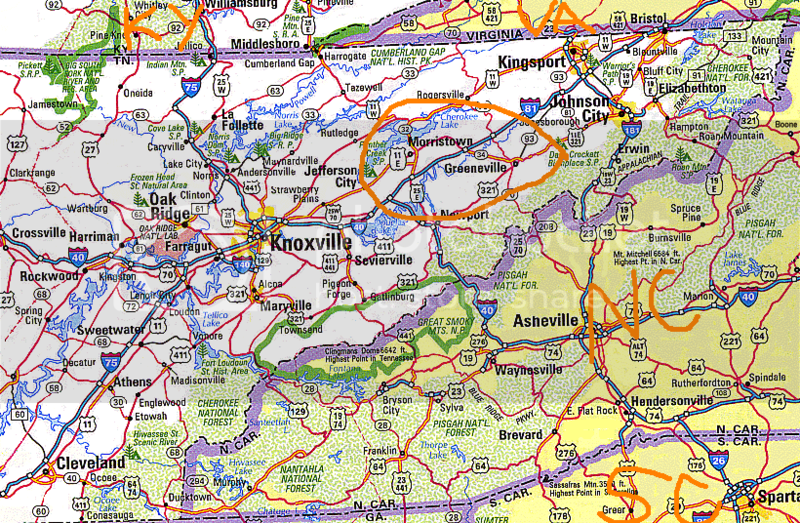 I do know that it will be somewhere within in that bright orange circle below though. Will any of you be neighbors??? We will be a short distance from KY, VA and NC as well. We will now be 4.5 hours away from the nearest grandparent. Lord, help me. Although we will still be living in the same state, this will be the first time either of us have moved somewhere with ZERO connections. To say I'm nervous about that is a major understatement. The closest (depending on where we land) is somewhere between 30 - 45 minutes away. There is also a good possibility that our neighbors will consist of cattle. Yes, we are headed to no-where-ville. We are pretty much guaranteed to have beautiful mountain views though and that....I'm excited about. I have missed the mountains. There is a lot to be done and a lot of decisions to be made in a very short period of time. Relocations happen in a flash around here so I'm sure things will be moving before I even get my mind wrapped around the idea. I'm very sad we have to leave our family, but this decision to move was a good one for us. It's the answer to many prayers we have been sending God's way. I hope we will be back again some day, but for now I am excited about our new adventure. While I'm super happy for y'all, I'm so sad that your leaving the 'boro!! Especially since we just figured out we live in the same city! We do drive that way to go home to VA! How exciting!! A change of pace will do a body good! Good luck with the move! Is it job related? I totally hear you on the local support from family. While my family is all within an hour's drive of me, it's still challenging sometimes to see them regularly with our work and family schedules. It's definitely one of the things I miss having, all of us in the same town, which is what I had growing up. My in-laws are in Illinois (we are in NJ) so that means only a few visits a year, if we are lucky. Hope all goes smooth...things happen for a reason! Good luck Mama!! I am just going through my reader for the first time this week so I saw yesterday's post and quickly refreshed to see if you had shared today. Prayers for you as you make this transition. Oh my goodness Laura!! That is some change for sure! I cannot wait to see what lies ahead for your family. I bet the mountains will be a nice new reality! As for no Target...maybe Ethan will like that 30 minute ride haha. Prayers for you and the family during this new transition! congrats on the big move!! but holy cow, no target?!?! ?